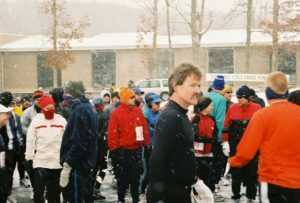 2006 race in Montgomery Bell State Park. Sergio and Billy wearing the first 1979 shirt. Date: Saturday, February 2, 2019 at 11:00 AM Central Time. Location: Cedars of Lebanon State Park, Lebanon, TN 37090, on Hwy 231 halfway between Lebanon and Murfreesboro. Start and Finish: At Assembly Hall on Cedar Forest Road (near Campground). Certified Course (TN17016MS): Partial loop with two out and back sections. Water and Gatorade at miles 3, 7, and 10. Entry fee: Pre-registration with long sleeve, technical shirt $22. Pre-registration without shirt $10. 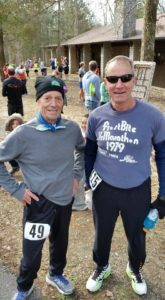 Late fee after January 25, 2019 and race day $15 (no shirt). Mail-in Form FB-19 to: 205 Woodland Court, Hermitage, TN 37076.